This is my post on how to reduce dust in your home. If you can’t view the video, please click here. Lately I’ve been finding that I wake every morning feeling really stuffed up. Now I know I suffer from hayfever from about May, but seeing as it still feels like January, I can’t imagine that’s it. Sorry mum for using this picture! I looked into potential causes. The most obvious one was a dust allergy so I thought I’d share my research with you as it’s so important to have a healthy home. If you’re finding that you’re generally quite congested, you wake up sneezing every morning, or you just have a lot of bogies, it might be that there is a little more dust in your house than you’d like. Now don’t be offended – if you could see the mini dust farms I found in my house you would rest easy! There are many dust traps we are unaware of and the best place to start is your bed as it’s literally a haven for dust and a skin flakes – eurgh! Apparently, you need to be changing your bedding every single week and you need to dry clean or wash your actual pillow. Although the dry cleaning option, in my opinion, isn’t the best because of the chemicals they use. Vacuum your mattress often and you should most certainly use a dust mite mattress cover. When you think how much time we spend in bed, it makes sense for this to be your main focus. Clean surfaces with a damp microfibre cloth as this prevents the dust from filling the air and then just landing again – annoying! 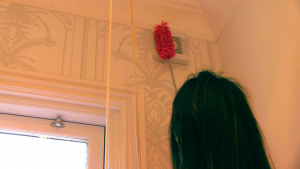 Dust any air vents or extractor fans regularly. It’s also worth investing in an air purifier. Obviously vacuum regularly, paying particular attention to the edge of carpets and skirting boards. Using one with a HEPA filter to bust the dust, pollen and animal dander is the best option. Ooh and don’t forget to vacuum your settee as it can become a bit of a dust factory. Hard flooring is of course better for dust prevention than carpet. Use a damp mop to finish it off. But be careful if you have varnished floorboards as they don’t mix well with water. Closing windows on a windy day will stop an army of particles intruding. Your doormat should actually be outside of your front door and it helps if you remove shoes before you enter. Blinds are most definitely better than curtains for reducing dust in the house. If you’re shouting at me right now as you’ve just spent a fortune putting curtains up, just make sure you shake them regularly out of an open window. Also cleaning them more often than you might normally bother (so more than every 10 years!) is an idea! Another step towards a healthy house is creating an exercise area! Check out my guide. Maybe reducing dust in your house should go on your house goals list! 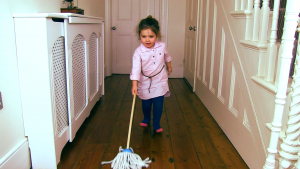 An interesting topic Georgina , Its amazing how much dust can be let into the home on a windy day! I’ve recently fitted cladded reclaim timber to a wall as a feature…lots of dust afterwards! Yeah must admit I suffer from hay fever terribly too. Can you imagine Dexter letting me shave his mop? It’s hard enough getting his claws cut!